Update: This is now a Barrett Brown individual mission, not an Anonymous mission. Here's Brown's latest. Shorter version: Barrett Brown, drug warrior recruit. 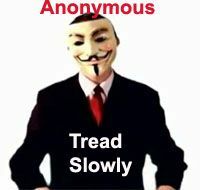 Anonymous has again canceled OpCartel, its threatened exposure operation against the Zetas cartel. It says its kidnapped member has been released. It also says retaliation threats played a role. The cartel had threatened to kill 10 people for each name of a Zeta supporter revealed. Barrett Brown, on Twitter, says he will "now go after other cartels with help from informants" and that the e-mails identifying Zeta supporters will go to Der Spiegel. After it was cancelled we got to talking about it, and the video got a whole lot of views. [Members of Anonymous] had a vote amongst themselves and decided to go ahead."